New Delhi: For the Indian Space Research Organisation (Isro), this has been a remarkable year. It took two launches to make it so. The first, in February, set the startling record of the maximum satellites injected into orbit by a single launch, 104—a tremendous leap from the previous record of 37. The second, in June, was the first successful launch of India’s heaviest, most powerful rocket, GSLV Mark III, developed entirely at home, through more than 15 years of patient work. GSLV is short for Geosynchronous Satellite Launch Vehicle. Beyond the usual registers of ingenuity, scientific progress and national pride that space programmes evoke, these launches marked a strictly business-oriented milestone: It announced the ambitions of Antrix Corp. Ltd, Isro’s fledgling commercial arm, of becoming a serious contender in the $335.5 billion global space industry, and part of a new space race that is poised for take-off. “In the next five years, the growth in space will be mind-boggling," says Rakesh Sasibhushan, Antrix’s chairman and managing director. “It will change the way we do things and the kind of technology we will be able to put in space." Billions of dollars worth of new investment have poured in for a clutch of new projects with old roots, providing high-speed satellite Internet connections that will blanket the globe. Isro and Antrix are uniquely positioned to take advantage of this because the nature of the project involves placing thousands of small satellites in a so-called Low Earth Orbit, or LEO, the very thing that Isro’s most successful rocket, PSLV, does so well (the 104-satellite launch was all about small satellites being put into LEO). PSLV stands for Polar Satellite Launch Vehicle. Antrix, says Sasibhushan, is looking at “an unprecedented transition period because of the growing global market". “The 104 launch by the PSLV has been a big boost for us as far as marketing is concerned," he says. “In business terms, we are looking at a major milestone in the next one year." The new space race needs a lot of rockets. Most of the world’s Internet works through terrestrial connections. One of the major reasons why communication satellites that are in geosynchronous orbits (at around 35,000km from earth), are not used for Internet is “latency"—the time lag that is introduced when signals have to travel back and forth from the satellites. It takes a radio wave at least 230 milliseconds to get to geosynchronous orbit and back; a signal through a fibre optic cable can travel between New Delhi and London around eight times in that time. But the terrestrial network has its own limitations; despite the galloping demand for connectivity, Internet users across the world are still clustered mainly in urban areas, because those are the areas the cables reach. Forget India or African countries, even large swathes of the US do not have access to fast broadband connections. Yet, the global demand for broadband services continues to grow at light speed; according to a report by Cisco Systems Inc. last year, over 1,000 billion gigabytes of data was exchanged in 2016. By 2020, that figure is expected to double, and the number of “connected" devices is projected to become around thrice the global population. Enter SpaceX founder Elon Musk. To meet these needs, and to overcome the problem of time lag, SpaceX plans to instal a “constellation" of small satellites in LEO (between 1,150-1,350km above earth). The idea is that this constellation—4,425 satellites according to SpaceX—will be able to provide coverage to every part of the planet. The satellites will deliver broadband using Ka- and Ku-band radio frequencies and move data between each other using laser links in a mesh network. The latency will drop to nothing because of the small distance between the satellites and the ground systems. SpaceX plans to begin testing prototypes this year, and launch its first satellites in 2019, with full capacity service expected to begin by 2024. In May, the US regulatory body Federal Communications Commission held a hearing for SpaceX’s application. Musk is not alone in betting on broadband satellites, an idea that first took shape in the 1990s with American companies Teledesic and Iridium, and ended in spectacular failures. This time, the results may be very different. For one, the technology for both satellite manufacturing and launch vehicles has undergone cosmic changes. And, as Carolyn Belle, satellite and launch industry analyst at Northern Sky Research (NSR), a space market research and consulting services firm, says, “The times have changed." “In the 1990s, the idea was a bit too early," she says. “But now connectivity and mobile Internet network is in every part of our lives." Musk’s opponents in this race include OneWeb, a London-based consortium backed by Sunil Bharti Mittal and Richard Branson, among others, that raised $500 million from investors in 2015 when it announced the plans, and received a further $1.7 billion this year from Japan’s SoftBank Group Corp. after it merged with satellite telecom firm Intelsat (SpaceX raised $1 billion, with backing from Google). Boeing Co. is also in the fray and Bloomberg reported in April that Apple Inc. may be funding its efforts. There are smaller firms such as US-based LeoSat as well. Samsung Electronics Co. Ltd too has outlined similar plans. The International Telecommunication Union, which designates orbital slots for communication satellites, says it has received 35 filings since 2015 for broadband constellations, most of them involving “mega constellations". The target is a share of the $30 billion in revenue from satellite Internet by 2025, according to a forecast by SpaceX. All of this is just to say that if things go according to plan, thousands of new satellites will have to be launched in the next five years, at a frequency that is unheard of. “This is now a separate market (small satellites)," says Belle of NSR. “Right now, commercial operators are restrained most by launch availability—they have satellites, but no way to put them into orbit." While SpaceX will use its own launch services for its constellation, OneWeb has already secured services for its proposed 648-satellite constellation through a deal between European Space Agency’s Arianespace, Russia’s Roscosmos and Virgin Galactic; valued at over $1 billion, it’s the largest commercial launch purchase in history. That leaves all the other Internet broadband firms scrambling to secure launches. “So when you have something like a 104 satellites launched in one go, it opens up intriguing possibilities; it adds a lot of value for whatever company can secure such a deal," says Belle. Sasibhushan says that Antrix is already in discussions with some of the companies in the broadband space race, though he did not disclose names. “Currently, we have on hand orders of around Rs600 crore, for PSLV launches up to 2020," he says, “We are expecting many more orders to come in." So far, India has been an insignificant entity in the space business, where roughly 80% of the revenue has historically come from the launch of heavy satellites in geosynchronous orbits. Despite the success of the GSLV Mark III, India still does not have a rocket powerful enough to do that. It relies almost entirely on Arianespace to launch its own heavy satellites. PSLV, a smaller vehicle, has been in use since 1994, and slowly built a reputation for reliability over the next decade, launching a handful of small satellites for other countries. 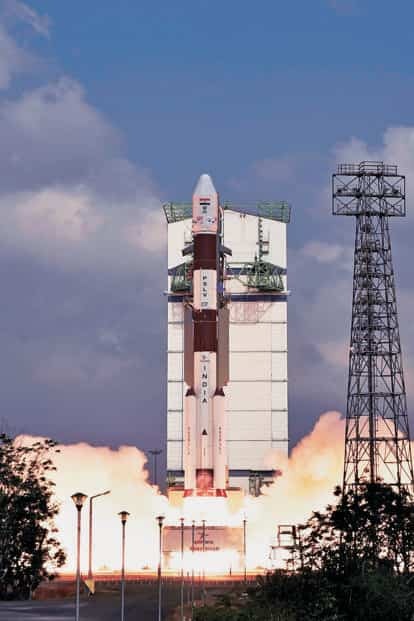 Since 2008, PSLV’s “order book" began to show a spike in interest, and in 2013, when it successfully launched India’s Mars Orbiter, the cheapest ever mission to Mars, there was a further boost to orders. Till around five years back, there was little commercial interest in putting small satellites in LEO. Now there are all kinds of companies that want that space, for remote sensing, earth imaging and communication. This change of orbital interest coincided with another development that turned out to be lucky for Antrix. The global vehicle of choice for launching small satellites, a Russian-Ukrainian converted intercontinental ballistic missile called Dnepr, was decommissioned after the Russian annexation of Crimea led to tension between the two countries in 2015. Russia’s space agency suspended its joint programme with Ukraine to launch the rockets. It was Dnepr that had held the previous record for most satellites deployed in a single launch, when it put 37 of them in orbit in 2014. PSLV stepped in. In 2015, three PSLV flights put 18 foreign satellites in orbit; previously, it used to average four foreign satellites a year. More launches followed in quick succession, including the full constellation of 100 satellites for US-based start-up Planet Labs, an earth observation company that hopes to begin data services by the end of this year. Twelve Planet Labs satellites travelled on a PSLV in June 2016, and the rest were a part of the record 104-satellite launch. Yet, says Sasibhusan, “the launch market using the PSLV is still not large. It brings in only 20% of our revenue". Most of Antrix’s revenue (it made a profit after tax of Rs209.13 crore in 2015-16, up from Rs205.10 crore in 2014-15) comes from satellite communication services, and the biggest contributor is direct-to-home television. Now that this is set to change with the battle for satellite broadband, Isro and Antrix are increasingly focusing on making PSLV launches more commercially attractive. First off, PSLV is marketed as the cheapest launch vehicle in the world. A launch by Ariane-5, the most successful commercial rocket in use right now, costs more than $100 million, while that by SpaceX’s Falcon 9 costs around $62 million. When SpaceX introduced Falcon 9, there was serious disruption in the market, with Arianespace and other firms scrambling to bring costs down. In comparison, a PSLV launch costs $15 million, yet the cost is not considered disruptive enough. “The dynamics of launch costs are a complex area," says Belle of NSR. “The PSLV is far less capable than the Ariane 5, for example, being used to deliver satellites with a lower total mass to LEO rather than GEO, thus should be a lower cost. Costs must always be made by approximate price per kg to the same orbit to eliminate these variables." Taking such variables into account, Belle says that “commercial operators have clearly stated that the launch prices they have received from Isro are not that much cheaper than the proposed American or European launch prices". For Belle, the availability and frequency of launches is a far more pressing concern for companies. “The business requires the constellation to be in place," she says. “If you are waiting for launches, and you can’t get more than 10 or so satellites up in a year, then you may have to drop the idea altogether." This is one of the chief reasons why OneWeb has secured a multi-agency deal, involving multiple rockets and launch sites. Improving the frequency of launches is on top of Isro’s priorities as well. “There is a great demand for PSLV launches and our primary aim now is to streamline the activity so we can have more frequent launches," says Isro’s chairman A.S. Kiran Kumar. “At the moment we are doing four-five a year. By 2020, we are hoping to get to 18 launches a year." Work is on at multiple fronts to make this happen. A second vehicle assembly building is being added to Isro’s launch site at Sriharikota, so that even while one mission is ongoing, another vehicle can be in preparation. Already, Kiran Kumar says, by streamlining various processes and bringing in better technology, the gap between two launches has been reduced from 70 days to 30 days (till 2007, there used to be one launch every two years). In June, the new capacity is being put to the test for the first time, with the GSLV Mark III launched in the first week, and a PSLV launch scheduled for the last week of the month. There is still a major barrier before Antrix can properly exploit Isro’s launch capabilities: as a national space agency, the priority for Isro is not business, but national missions, and commercial launches are accommodated only when some spare capacity opens up. “There has always been a huge gap in national needs for strategic or civilian use," says Kiran Kumar, “and we have worked to bridge that gap. But the gap is still there; we need double the number of satellites that we already have, so commercial activity cannot be a priority." This year, for example, Antrix has not had much to do after the February launch of PSLV because of the lack of spare capacity. “We are not at all in the same domain as SpaceX or other private space companies," says Sasibhushan. “Our vision is to build a strong ecosystem for the space industry in India. We have very good intellectual assets and a host of good technology sitting at Isro and we want to manage that and see how we can work with private companies so they can build their portfolios and also complement Isro’s program." Space is still an entirely government-controlled entity in India, unlike in the US or in Europe, where it has been increasingly privatized since the 1980s, turning their national space agencies into managing and contracting organizations. Isro has promised for long to move in that direction, but has had to walk the tricky line of strategic limitations and government regulations. The space agency has an enduring relationship with close to 400 companies, but none of the companies can offer the products they make for Isro to the general market. For the same strategic reasons, Isro also keeps tight control over technology as well as material. Godrej Aerospace, which manufactures the engines and boosters for Isro’s rockets, for example, has had to turn down inquiries from global companies for its products. The final assembly for the engines is also not in its hands and is done by Isro. Private companies are not allowed to build or operate satellites for their own commercial use. All of this is set to change. This year, Isro contracted out one of its satellite integration facilities to a private company, Alpha Design Technology Pvt. Ltd. Work has also started with Godrej Aerospace to enable them to make the final engine or “stage". “It needs a lot of government approvals still, but Isro has internally begun the process of farming out the manufacturing of the PSLV entirely to private industry," says S.M. Vaidya, executive vice-president and business head at Godrej Aerospace. “All the existing players have been asked to step up by one level." Vaidya says that it is only a matter of two-three years before this goal is realized. “We’ve waited for 20 years, but now we are close." It is not just regulatory issues that have delayed this opening up, but also technical ones. The Vikas engine built by Godrej Aerospace for PSLV has been a work in progress for years, and it is only in the last 10 flights, says Vaidya, that its accuracy has reached 99% on all parameters. The increasing frequency of launches by Isro has also helped Godrej Aerospace to finally justify its rocket engine business. “Till 2014, our production lines were operating at 30-40% capacity, making one engine per year," says Vaidya. “Now we are working at 60-70%, because Isro now needs seven-eight engine per year, and we hope to hit 90% in the next two years. To give you some perspective, you need to operate at 80% to break even." This year, the GSLV Mark III flew on India’s first fully home-grown cryogenic engine. But the engine makers are poised for another major leap already. “We are making a 200-tonne semi-cryogenic engine—the second biggest booster in the world," says Vaidya. “It has gone for sub-systems testing, and we are set to deliver by the end of the year." Sasibhushan, who has been with Isro since 1984, and spent 25 years in manufacturing before taking charge of Antrix last year, is driving some of these changes. “I know what it takes to make a space system," he says. “I knew what changes were required in manufacturing to make it commercial. We are looking at technology sharing as a step-by-step process. First we are looking at sharing tech that can’t do damage, that’s not sensitive, but which will enable a company to enter the growing global market in space." Isro is also helping companies get space qualification, a strict requirement in the business. Not a single nut or bolt can make it to the market without being space-qualified, which basically means that it can handle the extreme conditions in space. “We have end-to-end solutions if you look at it," says Sasibhushan. TeamIndus, a seven-year-old Bengaluru start-up that is in the news for being the only Indian company in the Google Lunar XPrize competition, is a perfect example of this new push. It is hoping to land an indigenously developed spacecraft on the moon—that’s the objective of the Lunar XPrize competition—and has secured a launch contract with Antrix for this December for an undisclosed sum. “Without Isro, we wouldn’t be here," says Ramnath Babu, head of operations at TeamIndus (his designation is “Jedi Master, Operations".) “They let us use their machining centres, facilities you won’t find anywhere else in India. Isro went beyond their obligations. I remember being at their facility for one such test last year, and every Isro team was there before time, and they all worked after duty hours." The 49-year-old renewable energy expert says that he is confident that Indian firms will finally get a slice of the space industry. TeamIndus, once the Lunar XPrize contest is over, will focus on making cost-effective satellite platforms or buses. “There is growing demand for satellites for weather forecasting, earth observation, remote sensing, broadband, and everyone from Google to Facebook want to launch more satellites," says Babu. “In another seven years, you will have a lot of space entrepreneurs like me." Sasibhushan says that enabling Indian companies to make low-cost satellites is something Antrix is actively working towards. “We are looking at technology developed by Isro that can be leveraged to make India the hub of cheap small satellite manufacturing." There is still a long distance to go. For one, that precarious balance between national demands and commercial ambitions is still weighed heavily towards the former. “Isro has such pressure and backlog for national missions that it’s very hard for them focus on the commercial side," says Vaidya. “Huge integrated investments have to be made in both Isro and private industry before we can hope to enter the global space business, and that will take at least five or six more years."